On July 1, 1920, Walter Johnson was attempting to complete a feat that had thus far eluded him in his thirteen-year career. The Washington Senator hurler was one out away from pitching his first no-hitter. Johnson was pitching a great game, striking out 10 Red Sox hitters and getting six others to foul out. He was clinging to a 1-0 lead in front of a small crowd of 3,000 at Fenway Park. Joe Judge created that kind of “luck” for pitchers his whole career with his superb defense. He was a great fielder, leading American League first baseman six times and finishing second five other years. He was not the prototypical first sacker, standing 5’8 ½”, but he was one of the game’s best. He retired with a .993 fielding percentage, a mark that stood for 30 years, but his defense was only part of the tale. The left-handed swinging Judge brought a lethal stick to the Washington lineup, hitting over .290 for 11 straight seasons beginning in 1920. Yes, Joe Judge was the complete ballplayer, and one of the best first baseman of his era, or any other. Joseph Ignatius Judge was born May 25, 1894 in Brooklyn, New York. He was one of four children born to Joseph Patrick and Catherine Judge. The elder Judge worked for the Edison Electric Company. Joe attended elementary school at St. Vincent Ferrer, dropping out after the eighth grade. Joe played semi-pro ball as a teenager, attracting the attention of New York Giants Manager, John McGraw. But McGraw advised the youngster that he would be better off as a pitcher, as he was too short to make it as a first baseman. The Judge family relocated to Yorkville, a neighborhood in Manhattan, and Joe joined the Yorkville Orients semipro team. The move to Yorkville was a fortuitous one for Judge. One day, as the team practiced, a mail carrier was watching the scene, taking note of the young, left-handed man playing shortstop. The postman, Bud Hannah, told Judge he would never make it to the majors playing an infield position left-handed. Hannah further told Joe to get himself a first baseman’s glove, and to start practicing to become a first sacker. Judge told Hannah that he was poor and could not afford a new glove. The next day Hannah showed up at the practice field and gave Joe a box. “Inside was the most beautiful first baseman’s mitt I’ve ever seen, before or since. I don’t know how he could afford it. Mailmen didn’t get much in those days. It must have set him back a week’s pay,” recalled Judge. When Joe became a big leaguer, he always left a pair of tickets for Hannah when the team played in New York. “It was little enough for me to do for him after all he had done for me,”ii said Judge. The Boston Red Sox signed Judge to a contract in the fall of 1913, and they farmed him out to Class B Lewiston (ME) of the New England League in 1914. That season he met Alma Gauvreau while playing a series in Vermont. She was of French-Canadian descent, and married the Irishman that year. They had four children, Catherine, Anita, Dorothy and Joseph Jr. The Boston front office wanted to send him to Class AA Providence (RI) of the International League for the next season, but at a reduced salary. Judge argued his case, and was released. Judge then signed on with Buffalo of the International League in 1915. On a scouting trip to Buffalo, Washington Manager Clark Griffith saw two players he was interested in purchasing, including outfielder Charlie Jamieson. Griffith also noticed Judge’s work around the bag, and believed that he could hit big league pitching. 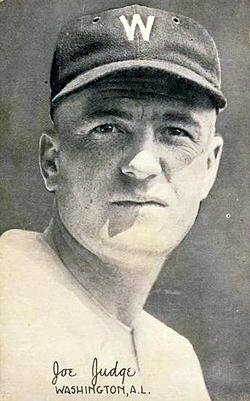 In truth, Griffith had become disillusioned with his current first baseman, Arnold “Chick” Gandil, who was somewhat of an irresponsible malcontent,who broke team rules. Griffith coaxed Buffalo owner David Harum to throw Judge into the deal, for the bargain price of $500. Judge became the Senators’ starting first baseman in 1916 after Gandil was sold to Cleveland and stayed there for 15 seasons. The Washington Star reported that “Griffith is very much impressed with Judge’s ability as a hitter and a speed artist.”iii Judge did not immediately demonstrate this ability to swing the lumber, as he hit a paltry .220 as a rookie. He improved to .285 the next year, but his season was cut short when he broke his leg sliding into second base at Detroit’s Navin Field on August 18. He still led the league in games played by a first baseman with 130. The Senators also improved on their usual second-division finish in the American League by placing third. Johnson led the pitching staff with a 23-7 record and a miniscule 1.27 ERA. He started 29 games, and completed all of them. World War I was in full swing in 1917 and Secretary of War Newton D. Baker proclaimed that baseball players would serve in the war, either by fighting or working in war jobs. Judge, married with two young daughters, was given a deferment. Judge hit a career high.333 in 1920. He had five hits in a game twice, once on May 7 against New York and on May 29 versus Cleveland. He committed 10 errors that season as well, the last time he would record hit double-digits in that category. The 1920 season was also Griffith’s last as manager. As the deadball era was ending, Griffith was slowly putting the pieces together for a competitive team, with Johnson, Judge and Judge’s fellow outfielder Sam Rice, as the foundation. Rice and Judge were teammates for 18 seasons in Washington, which was a record for the longest pairing of two teammates until surpassed by Detroit’s Alan Trammell and Lou Whitaker (1977-1995). In 1918, Judge played a handful of games with the Baltimore Drydocks, a shipyard team he joined in keeping with the pattern for many major leaguers during World War I. Also on the team was young second baseman, Stanley “Bucky” Harris, whom Judge and scout Joe Engel recommended to Griffith. The “Old Fox” then acquired Harris in a trade with Buffalo in 1919, thus solidifying the right side of the Senator infield for many years. In 1921 Griffith signed outfielder Goose Goslin from Columbia (SC) of the South Atlantic League for $7,000 and obtained shortstop Roger Peckinpaugh in a trade with Boston in 1922. When Ossie Bluege was signed to man the hot corner for the 1923 campaign, the Nats’ infield was being compared to Connie Mack’s famed $100,000 infield in Philadelphia. Griffith admitted that while Mack’s foursome might outhit his, he was confident that “we could outfield them in three of four positions”iv. Griffith gave the reins of the team to 27-year old Harris. Bucky believed that the two traits a manager must have to be successful was to first know when to pull a pitcher and second to be more friendly to the players. The acquisitions, and Harris’s managerial style, paid off for the Senators, as they took back-to-back pennants in 1924 and 1925. They finished strong, winning 10 of 13 games to nip the New York Yankees by two games in 1924. Judge was third on the team with a .314 batting average and Goslin led the league in RBIs with 129. Their opponent in the World Series was the New York Giants, and Judge’s old friend John McGraw. The New York skipper got a first-hand look at the damage the “too short” first baseman could cause as Judge batted .385 for the Series and walked five times. Surprisingly it was Tom Zachary who was the hero of the mounds corps, winning two games, while Johnson posted a 1-2 record. Trailing the Giants three games to two, Zachary won Game Six. Johnson notched his only win, pitching four scoreless innings in relief of a twelve inning Game Seven. An Earl McNeely double scored Muddy Ruel from second base to give thet Senators their only world championship. Judge suffered through a myriad of ailments in 1925. Leg injuries kept him out of several games. On August 21, he was struck in the head by an Earl Whitehill fastball in the second inning. The ball bounced into the stands, but the batter fell flat on his face, lying motionless at the plate. Although subsequent x-rays revealed no fracture, there was evidence of a concussion and a slight blood clot. He did not return to action until September 5. Joe still battled to hit .314 for the year with 31 doubles, tying him for second on the team. The competition for the pennant this season was Philadelphia. The Athletics held a slim 1½ game lead going into the final two months of the season. But a 19-10 record in August pushed Washington in front. They finished strong, compiling a 17-8 record in September, claiming the league title by an 8½ game margin over the A’s. Their opponent in the series was the Pittsburgh Pirates. Harris had been quoted in the Sporting News on July 16 that it would be a good thing for baseball if Pittsburgh won the pennant and broke up the monopoly enjoyed by McGraw’s Giants. Perhaps Bucky never heard of the saying “Be careful what you wish for”. Bucs hurler Vic Aldridge beat Stan Coveleski twice, and Pirates reliever Ray Kremer won two games out of the pen in Games 6 and 7. The Senators could not figure out Max Carey who hit .458, or Pie Traynor, who hit .356. Judge hit a homer in Game Two, and drove in four runs in the series. Judge continued his high production for the remainder or the decade. He hit over .300 in each season, and led the league in fielding in both 1927 and 1929. But the Senators were getting old. One example was Harris, who at 32 years of age hit .204 in 1928. Despite Judge’s excellent production,his job was put in jeopardy when Harris purchased George Sisler from the St, LouisBrowns prior to the 1928 season to play first base. Sisler was a year older then Joe, and received every opportunity in spring training to claim the job. Judge persevered, and Sisler ended up being used mostly in pinch-hitting situations, and spelled Judge at first base until he was sold to the Boston Braves on May 27. Notwithstanding the failed experiment with Sisler, the Senators continued their effort to unseat Judge as the starter at first base as he got older. They purchased Joe Kuhel from the Kansas City Blues of the American Association in 1930 for a reported $60,000. In May, 1931, Kuhel stepped in when Judge had an appendicitis attack at Fenway Park and did not relinquish the position. Judge returned to action until July but was relegated to back-up duty for the rest of that season and all of 1932. Judge’s playing days in the nation’s capital were over after the 1932 season. Johnson was also relieved of his duties. Judge had aspirations of managing the club, but Griffith chose Cronin to lead the team in 1933. Griffith looked like a genius with his selection when Joe Cronin led the team to the pennant that year. Judge moved over to the senior circuit, signing a one-year deal with Brooklyn. He played sparingly and was released on July 25. Two days later he was back in the American League, making Boston his home until May, 1934, when he was released. Judge retired with a .298 batting average and a slugging percentage of .422. He knocked in 1,034 runs in his career. He still ranks among the all-time leaders in games (2,084), assists (1,301), putouts (19,264) and double plays (1,500) by a first baseman. Judge was never far from the game of baseball, or from Washington D.C. for that matter. He was the head coach of the Georgetown University baseball team from 1937 until his retirement in 1958 except for a two-year leave beginning in 1945 as a Senators coach when Ossie Bluege managed the team. The Judge family suffered through tragedy when the oldest daughter Catherine passed away in 1957 as a result of cancer at 41 years of age. Joe Judge passed away on March 11, 1963 after suffering a heart attack while shoveling snow at his home in the Chevy Chase section of Washington, D.C.
Mark Armour, Joe Cronin: A Life in Baseball (University of Nebraska Press, 2010). Tom Deveaux, The Washington Senators, 1901-1971 (McFarland, 2001). C. Norman Willis, Washington Senators: All-Time Greats (Xlibris Corporation. 2003). Lyle Spatz, The SABR List and Record Book (Scribner Publishing, 2007). National Baseball Hall of Fame, Judge’s player file. i Henry W. Thomas, Walter Johnson--Baseball’s Big Train (Phenom Press, 1995), 66.
ii Mark Gauvreau Judge, Damn Senators, (Encounter Books, 2003), 31.
iv Shirley Povich, “This Morning,” Washington Post, May 30, 1945, 8.
v Tom Meany, “Judge one of Best—Mack.”World Telegram, March 23, 1933.